Comprising of just 68 rooms & suites, created to offer a truly relaxing experience, where guests delight in their own paradise. The Caprice Restaurant built a reputation by creating exciting cuisine with a Mediterranean twist. The Caprice Lounge Bar, trendy in design with dazzling sea views adapts de reisaanbieder ambience to suit the time of the day, serving coffees in the morning and fastastic cocktails at sundown. The Pool Bar is serving snacks and drinks during summer season. The Londa Spa offers beauty, health and spa facilities, and an amalgam of treatments and therapies for a truly rejuvenating experience. The hotel also caters for small meetings, weddings, celebrations and private events. All rooms and suites are cool and contemporary, but classic. Influeneces come from the sea as well as Cypriot accessories, antique filigree silver and wood. The Superior Side View (standard hotel's rtoom) is an open plan bedroom with either twin beds or queen size bed with bath, Molton Brown toiletries, personal bathrobe, slippers, magnifying mirror and balcony. (Facilities as mentioned here are in addition to the room and suites facilities mentioned above under section "Hotel Facilities"). 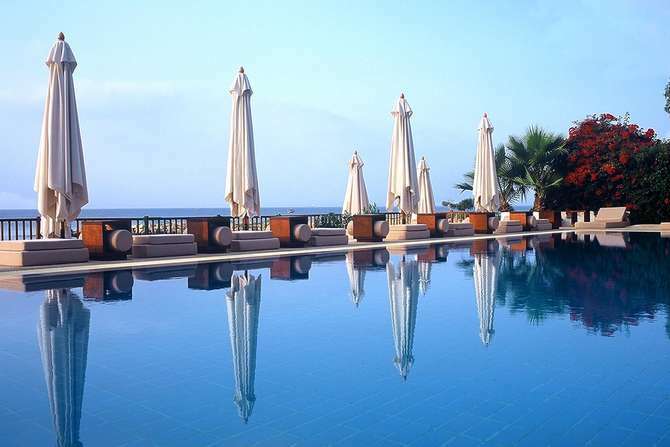 Conveniently located on de reisaanbieder own sandy beach away from the bustle of the town, yet only minutes away from Limassol's lifestyle centre, restaurants, banks, offices and nightlife places.